Posted on 13/12/2013 by Jayson	in Markets Comments and tagged ADX, STI, window dressing. 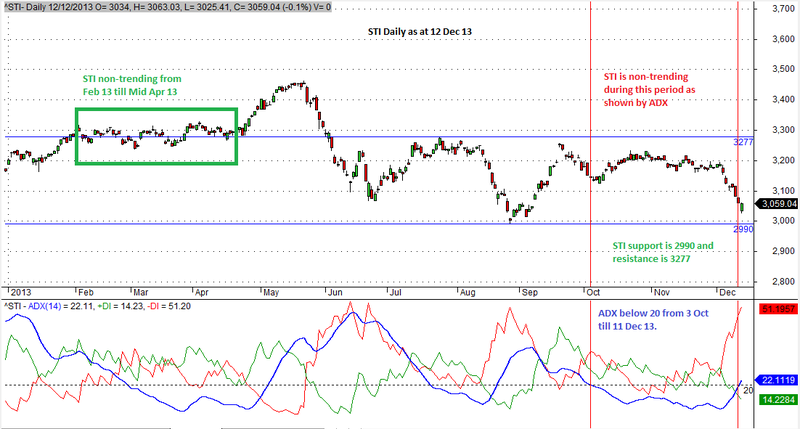 The STI has been moving sideways and non-trending since 3rd Oct till 11 Dec 13. This is clearly reflected in the ADX(14), where the indicator remained below 20 for a nearly 2 and a half months. Although December is a month for window dressing, it has yet to show signs of excitement. I would think that the green candle on 12 Dec 13 is an indication of it being temporary supported at 3025, given that there is a true support at this level. It is likely that the index will rebound from there. Although -DI is currently above +DI, but don’t forget indicators are lagging. The summary of STI’s performance for the whole year has been captured in the above chart. Nothing spectacular with most of the time being trapped between 3,277 and 2,990. The immediate resistance is at 3,200 and as at 12 Dec 13, STI is at 3,059. We shall see if there is any window dressing coming along that will boost the index to back to 3,200. However, for STI to climb 140 points within the remaining 2 weeks before the year ends, it seems to be rather challenging.